"At the first hint of warmth in the spring air, the vacant lots would beckon to us. Images of all the great pitchers would fill our heads. Winding up and letting go of the ball - so worn and used that it was held together with electrician’s tape - we would dream of someday standing before enormous crowds in baseball stadiums somewhere. Not all of us make it to the big leagues, but those of us who played, even in vacant lots, always have the game in our hearts." 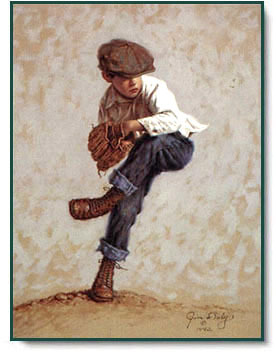 The Wind-Up copyright © 1994 by Jim Daly.